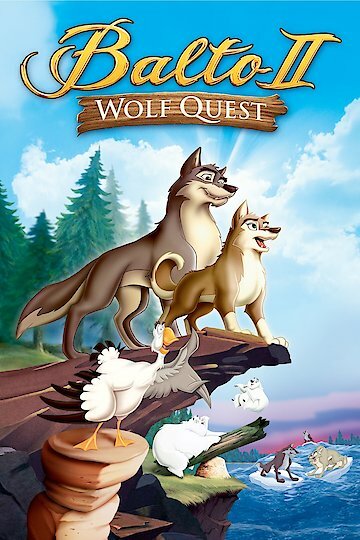 Balto II: Wolf Quest is a children’s animated sequel to the film, Balto, produced by Universal Studios in 1995. The film was released straight-to-DVD in 2002. The film follows the adventures of Balto and his daughter, Aleu. Balto is a wolfdog. His husky mate, Jenna, has recently given birth to a litter of six puppies. Five of the six puppies resemble their mother, but the final pup, Aleu, resembles her father. At the age of eight weeks, Aleu’s brothers and sisters are adopted, but she is left with her father, Balto. One year later, a hunter pursues Aleu, but she manages to escape. Balto then enlightens his daughter about her wolf heritage. Angry and upset, she leaves her home and runs off in hopes of discovering her true purpose. Meanwhile, Balto has been experiencing bizarre dreams of a wolf pack and a raven. When his daughter doesn’t return the following morning, he leaves in search of her. Along the way, he encounters a number of unfamiliar animals, including a grizzly bear, wolverines, a fox, and the same raven he has been seeing his dreams. Balto’s friends, Muk and Luk, plan to search for Balto, but they are unable to look for him. The two quickly realize that Aleu and Balto need to embark on this journey alone. Aleu and her father find each other after escaping a hungry bear. Aleu was able to read the bear’s thoughts, and this was what enabled them to escape. Aleu informs her father that she wishes to continue traveling until she discovers who she truly is. Aleu and Balto travel together and follow the raven Balto has been seeing in his dreams. Eventually, they come across a starving wolf pack near the ocean led by an elderly wolf with magical powers named Nava. He informs the other wolves that they will soon have a new pack leader. When Nava gets separated from his pack, Aleu leaves her father to take her rightful place as the pack’s new leader. Balto II: Wolf Quest is currently available to watch and stream, download, buy on demand at Netflix, Amazon, Vudu, Google Play, iTunes, YouTube VOD online.